Attention Sci-fi fans in Los Angeles! On April 10th, Open Road Films is holding a special promotional screening of their new upcoming Sci-Fi / Action / Adventure film, LOCKOUT. Plus, as a bonus, there will be a special Q&A session with the film’s stars, GUY PEARCE and MAGGIE GRACE after the screening. And you, our dear readers, have an exclusive opportunity to attend. 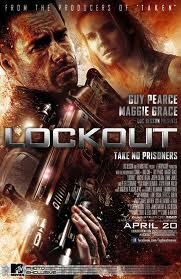 LOCKOUT follows a wrongly convicted man (Guy Pearce) who will win his freedom if he rescues the president’s daughter (Maggie Grace) from an outer-space prison that has been taken over by violent inmates. Lockout was directed by Stephen St. Leger and James Mather from their script co-written with Luc Besson, who is also a producer. OK, so it’s not exactly a “paranormal” themed film, but it takes place in outer space and that’s close enough for us. Besides, far be it from us to say no to FREE stuff for our readers. These special passes are first come, first serve, so don’t delay – grab ’em while you can and good luck! Click HERE, then click Get a Pass.